The Cromwell Alumni Reunion is a unique opportunity to meet all your school friends regardless of the school or year they graduated. Food was provided by "Old World Pizza Truck" from 1:00 p.m. to 4:00 p.m. featuring Unlimited Pizza and Mesclun Salad, followed by Dessert, including Cappuccino and Espresso. 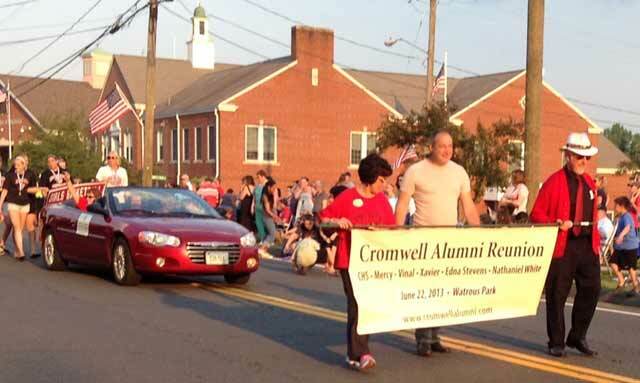 Visit us here at www.cromwellalumni.com for other alumni information. 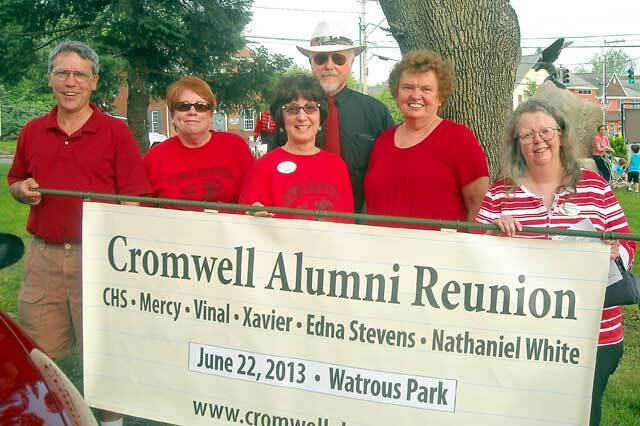 The Alumni committee at the start of the 2013 Cromwell Memorial Day parade. Alumni committee members: David Butler '70, Margaret Davis Colella '69, Paula Gugliemino Luna '65, John Swingen '66, Susan Butler Czaja '63, Nancy Dagle '66. Missing are Michael Groeper '68, Dianne Dagle Brainerd '74 and Sandy Clark Doyle '78. Would you like to help out at the Reunion? Contact Dianne Dagle Brainerd, she and Paula Gugliemino Luna will be coordinating the volunteer effort. No. We will have a sign in area, where we will check you in and give you a wrist band that lets the food vendor know you have paid. Can you host a classmate? Sign up at Couchsurfing.org to let people know that you have room. Alternately if you are coming from out of town, you can see if anything is available in Cromwell for that weekend. Join the All-school Alumni group on Facebook. No dues, no meetings, just for fun..